A dedicated organization, the age-old history of which is filled with charity, humanity, compassion. The founding principles of the International Red Cross and Red Crescent Movement, which govern the society, provide assistance to all needy without discrimination on the grounds of national, racial, sexual, religious, linguistic, class or political beliefs. The Red Cross develops a volunteer movement, broadens knowledge of international humanitarian law, educates people in first-aid skills, and so on. On the obverse of the coin, on a mirrored background of a stylized cross, there is a small State Emblem of Ukraine and the inscription UKRAINE; Principles and values ​​that guides the International Movement of the Red Cross and Red Crescent - HUMANITY / UNCERTAINTY / NEUTRALITY / INDEPENDENCE / VOLUNTARY / UNITY / UNIVERSALITY; Below: face value 5 / ГРИВЕНЬ and year of issue of the coin - 2018, logo of the Banknote-Mint of the National Bank of Ukraine (right). 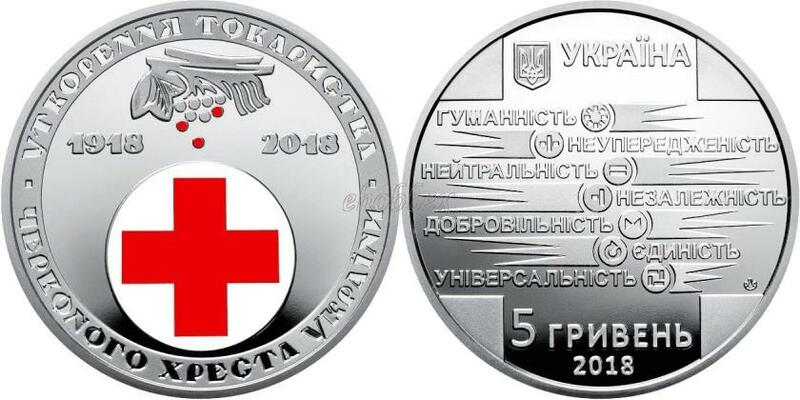 On the reverse of the coin there is: the emblem of the Red Cross (used tampon printing), over which is a stylized branch of the Kalina (some berries are red), under the branch years: 1918 (left) and 2018 (to the right), circular inscriptions: CREATION OF THE COMPANY (top) RED CHRISTMAS OF UKRAINE (below).